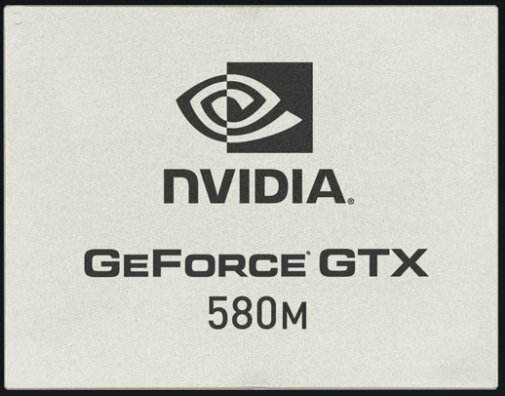 NVIDIA introduced its most powerful laptop graphics cards yet; the GeForce GTX 580M and GeForce GTX 570M. The 580M looks like a mobile version of the GF114, it has 384 CUDA cores, 620MHz core, 1240MHz shaders, 256-bit memory bus and 2GB GDDR5 clocked at 3GHz. 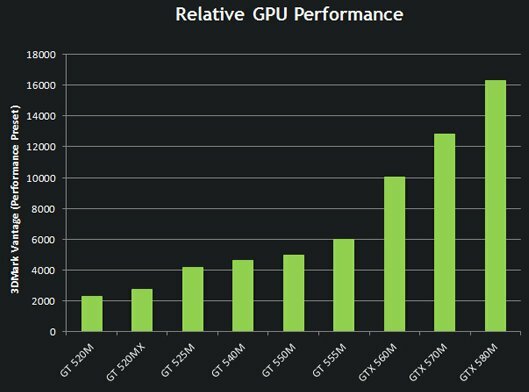 The GeForce GTX 570M likely has the same silicon, but with 336 CUDA cores, 575MHz core, 1150MHz shaders, 192-bit memory bus, and 1.5GB or 3GB GDDR5 clocked at 3GHz. Both chips support NVIDIA's Optimus technology but the company hasn't disclosed power consumption data yet. Dell's Alienware M18x is the first laptop with these new GPUs. NVIDIA today announced the world's fastest notebook graphics processing unit (GPU)(i), the NVIDIA(R) GeForce(R) GTX 580M. Available now in the Alienware M18x, the new GPU sets new standards in industry leading benchmarks and games. It will also be available soon in the Alienware M17x notebook along with NVIDIA Optimus(TM) technology. The first notebook PC to feature the GeForce GTX 580M, the Alienware M18x offers the option of two GeForce GTX 580M GPUs in one system for up to double the gaming performance, using NVIDIA SLI(R) technology. Not to be outdone, the Alienware M17x will offer the GeForce GTX 580M along with NVIDIA Optimus(TM) technology and will deliver 5 hours of battery life in Facebook, and 100 frames per second performance in Call of Duty: Black Ops. Support for NVIDIA 3D Vision(TM) technology, the #1 3D experience for notebooks, which automatically converts over 525 titles into immersive 3D. Support for NVIDIA 3DTV Play(TM) software, for connecting 3D Vision-based notebooks to 3D TVs. NVIDIA SLI(R) technology, which links two GTX GPUs for up to double your gaming performance. NVIDIA Optimus technology, which enables extra-long battery life by automatically switching on and off the GPU so that it runs only when needed. NVIDIA PhysX(R) engine support, which brings games to life with realistic physics. NVIDIA CUDA(R) architecture support, for GPU computing applications. NVIDIA Verde(TM) notebook drivers, for frequent performance improvements and rock-solid stability. Chips that can truly replace a desktop.